The Indigenous Defence Consortium (IDC) has signed a memorandum of understanding (MoU) with AFL club Port Adelaide to assist Indigenous-owned and operated businesses in tendering for defence contracts. The Port Adelaide Football Club said the MoU will work to realise the organisations' shared vision of developing a new generation of Aboriginal and Torres Strait Islander businesses and people with the skills and qualifications to benefit from the growth of defence and related industries. Provide opportunities for Aboriginal and Torres Strait Islander businesses to engage with industry leadership, educational institutions and state and federal governments. 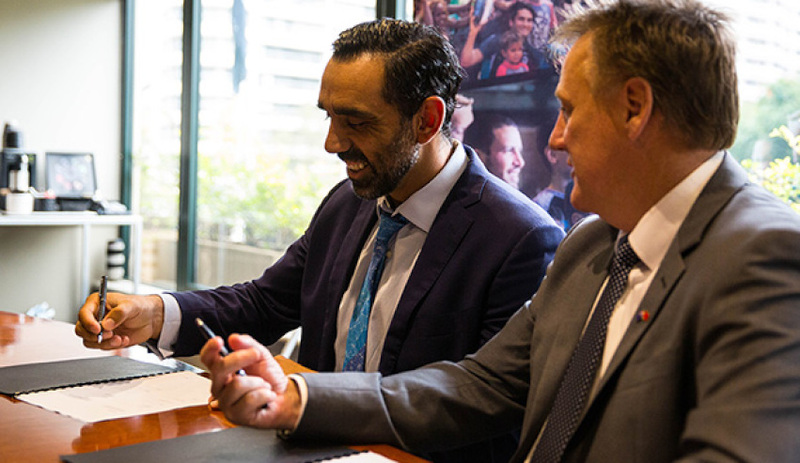 The MoU was signed by Port Adelaide's chief executive Keith Thomas and IDC CEO and former AFL premiership player and Brownlow medallist Adam Goodes. Thomas said the club was proud to further enhance its relationship with the defence industry. "Port Adelaide is proud to sign this memorandum of understanding with the Indigenous Defence Consortium," Thomas said. "We already have achieved great success in helping Aboriginal school students transition into further education and employment opportunities – 59 of our Aboriginal Power Cup participants were placed into work or tertiary study opportunities in the last 12 months. "With our positive relationship with the defence industry through our Power to Be Positive and Empowering Youth programs, we believe we will be able to work on successful outcomes for Aboriginal youth to find career pathways in this area." Goodes said the memorandum will give the IDC a connection with SA via Port Adelaide. "The partnership between IDC and Port Adelaide is ensuring the talents of young Aboriginal and Torres Strait Islander boys and girls are achieved on and off the sporting fields," Goodes said. "We at IDC want to create career paths for our future Indigenous leaders with a particular focus on STEM [science, technology, engineering, maths] subjects. "I’ve been very impressed with Port Adelaide’s Aboriginal programs and I’m really looking forward to seeing this partnership grow."